I did it – I completed my first 5k race on Saturday! Whenever I’ve mentioned that I’ve run a 5k before, I’ve always made sure to mention these were my own personal 3.1 mile or 5k’s. This was my first official, timed, 5k race and I’m pretty pleased with my accomplishment! I did not train for this race as hard as I could have. The weather has been in flux here since I registered and I was only able to run maybe three times a week. I don’t know my own limit and went from just walking to running 2-3 miles every time I’d run. I didn’t bother modifying my diet or changing anything else I do, I just started running. Since I usually run with the BOB with a 32 pound toddler in it and in an area with lots of hills, I wasn’t sure how I’d do running on my own. Obviously I thought I could do better running on my own, but I didn’t have any gauge as to how fast I could run or what to expect. I ran with two friends who had both run 5k’s before and they agreed to stay with me and let me set the pace. From the get go I just started running. Because of the hills, when I run at home, the most I’m able to run in one burst is about .60 miles. On race day, I ran 1.5 miles straight, averaging a 10:00/mile pace! The smart girls had on sunglasses despite the weather. The side cramps that plague me showed up around the 1.5 mile mark and I had to walk for a bit to stretch things out. I battled the side cramps for the remainder of the race and alternated walking and running. According to the Nike Run app, I ran a 37:03 race, but the picture below tells a different story. I’m still happy with a 38:36 (I can’t find where to locate the official time on the website, but I’m thinking that looks pretty official right there) or between 12-13 minutes for a mile, especially without really giving it my best effort! Hopefully with proper training and maybe some diet modifications, I will do even better on my next race. 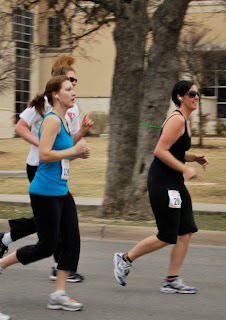 The Cap 10k (largest race in Texas) is coming up next month and I’m debating whether or not I’m capable of doing that. I wasn’t completely worn out after 3.1 miles but I’m still recovering two days later so I can only imagine if I were to double my race length, I’d be hurting even worse. I still have some time to decide but am still so unsure at this point what to do. Avoid races that are several hours away or stay closer to the location. Getting up at 4:30 in the morning after only 4 hours sleep doesn’t make for the best feeling in the world. Couple that with the two hour drive and a toddler prone to motion sickness in the morning – not a great way to start the day. Even if it’s overcast, wear sunglasses. Either that or wake up even earlier and put makeup on. There will be cameras. There will be bathrooms, if only port-a-potties, so properly hydrate before running and avoid side cramps. Cue up your running playlist before starting out, you’ll save yourself some frustration of having to run and scroll through to get things started. Have you ever run a 5k/10k/half/full marathon? How’d you do? Any advice? Congrats!! What a wonderful accomplishment!!!! lol j/k… No seriously though, I have horrible knees like my mom and grandma (and my poor son has them too, ugh) and I always end up with tendonitis no matter how much I prepare. Running = evil for me! Congratulations on making the 5k though!! You looks so cute! Congrats, what an accomplishment! Congrats to you for such an accomplishment! I am planning to run my first 5K in May of this year, and I could NOT just start out running! I'm using the Couch to 5K app on my iPod touch to help me "train," but like you, I'm not changing my diet or anything like that. I just want to see if I can make it to the finish line. Again, congrats on your time, and I'll be watching your blog to see if you sign up for the "biggie." Shop with me Mama posted this on Twitter, so I had to come over and check it out! Don't you feel like a rock star! I ran my second 5K this weekend, and was totally pumped because my husband ran with me. Side cramps – I get them when I'm running too fast, bottom line. I have a tendency to start out fast in a race (its so easy! ), and I really pooped out at the 2 mile mark. Thank Goodness for him cheering me on! Try to sleep REALLY well 2 nights before the race. I have bad nerves the night before a race, so I bank on that extra sleep 2 nights before. Try to take care of major bathroom business at home — there's nothing worse than running, and feeling the urge to go. For ladies with potentially leaky bladders, wear a pad. I came home, and the next day, signed my husband and I up for the 10K (next Saturday). Here in KY, we have a spring series – Triple Crown of Racing: 5K, 10K, and a 10 miler, which sets the stage for the Derby Festival Mini and Full Marathon. Sorry — posted that comment under my business account! congrats on the race I love coming to your blog to see what you have been up to. I awarded you the stylish blogger award. congrats!!! love your tips. i won't be running a 5k anytime soon i get side cramps just at the thought! but am hoping to get moving and walk one this fall. Congrats on your race!! I love your photos!!! I also have a FB page called "Motivated Mamas". We talk about our fitness goals, accountability and healthy recipes. Hope you can join us!! Stumbled back on your post! Kudos to you!! Great race! COngrats! More and more of my friends are running, but I've never really tried… walking is more my speed… stumbled you back! Stumbling back. Thank you for stopping by Two Little Cavaliers and stumbling us. WAY TO GO!!! What an accomplishment .. don't you feel so strong?! And you can definitely do a 10K. Push yourself, girl. Go for it!! Shopper Gal mentioned this above, but you might check out our Motivated Mamas site on FB. I think you'll love it and it might help you with your training. Congratulations! I am so envious, I would love to run a race someday. One of the benefits of Stumble Tumble Tuesday is beyond the obvious, it's an opportunity to read everyone's best posts of the week – love it! Stumbled! Here's mine: and there's a handy little stumble button at the bottom of the post.